Hello all and welcome to Neat & Tangled Release Week. Today is Day 1 and we are introducing two stamp set with matching dies. 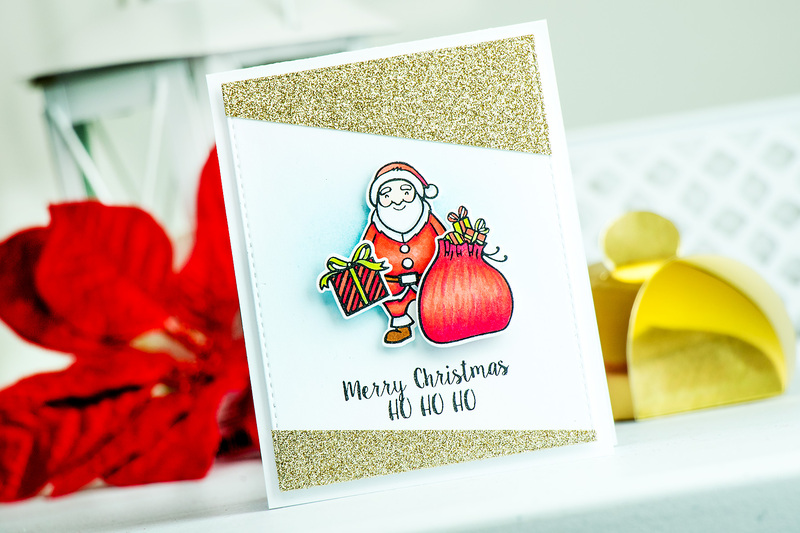 I’m sharing a project using fabulous Santa’s Ride set – perfect for holidays. 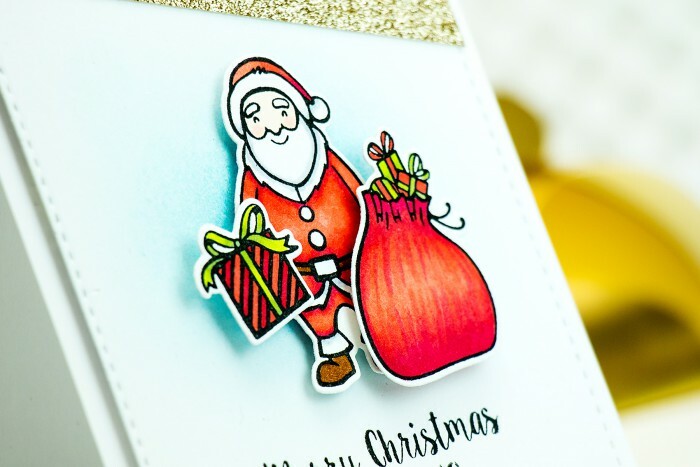 I used Santa’s image along with the sack and a little gift, stamped using Tsukineko Versa Fine Onyx Black ink on Neenah Solar White cardstock, heat set it and colored using Copic Markers. My Memento ink pad (the one I usually use when I like to color something with alcohol markers) is a bit dry, so this is why I used Versa Fine ink instead. If you heat set it, it doesn’t bleed when it comes in contact with alcohol. I die cut my colored images using matching dies and added a bit of Wink of Stella glitter to some sections to make them pop. I blended some light blue ink onto a white panel and trimmed it down using my Simon’s Stitched Rectangle die. I also created a diagonal top and bottom for my panel using glitter paper and also trimmed it using the same die. I foam mounted my colored and die cut images onto my white panel, stamped a simple Merry Christmas Ho Ho Ho sentiment and foam mounted this panel onto an A2 white top folding card base. Such gorgeous coloring! 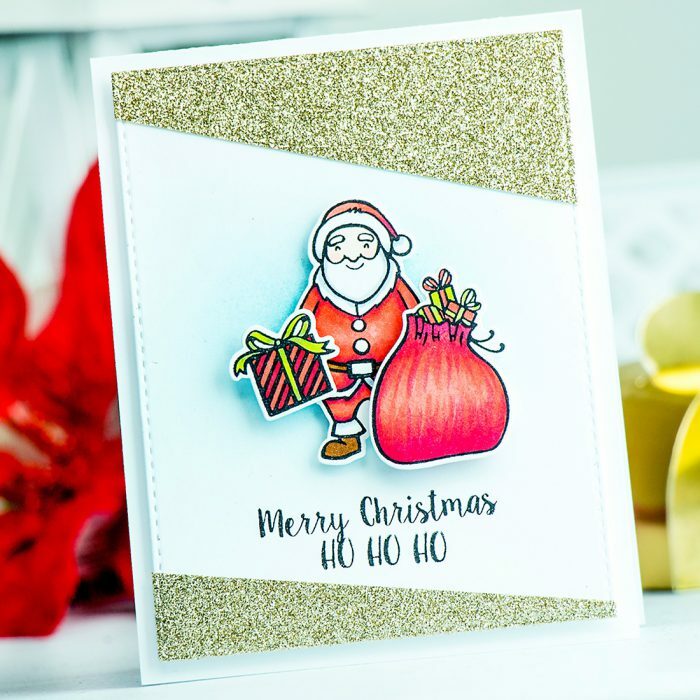 That glitter paper makes it so festive too, love this Yana! Such a great card Yana and your colouring is always perfect. Great job! The coloring on Santa’s sack is just too amazing. Love this card. Very beautiful! Such a classic Christmas look! 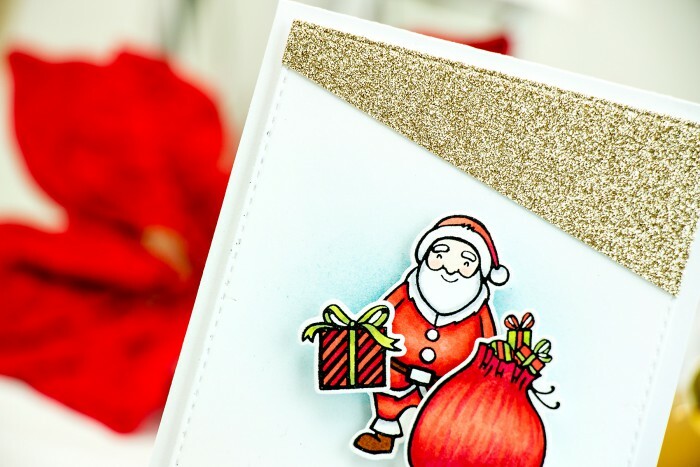 LOVE your CUTE Santa, BEAUTIFUL colouring and ELEGANT design with the angled SPARKLING gold panels!! !